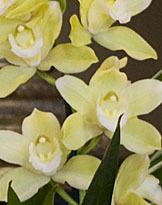 A petite Cymbidium with all the refined elegance of its more statuesque sister. 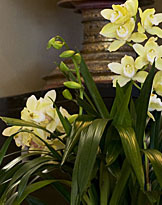 At a height of 1.5 to 3 feet above its lovely hand crafted Tahitian husk container, this dainty version is well-suited to any nook in your home and will still provide the lush foliage and creamy, white chocolate-lipped blooms you expect from a full-sized Cymbidium. 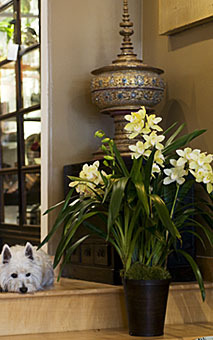 Perfect for home decoration and easily transferred outdoors as desired, with flowers that can last for several months. Available in Premium (multiple spike) or Standard (single spike) plants. (PLANT AND CACHEPOT ARE SHIPPED SEPARATELY).